These days, no website can afford to ignore social media, and that goes for WordPress websites too. However, while posting to social media is the easy part, the process of actually publishing your content could become a huge timesink. Fortunately, there are plenty of ways to automate this time-consuming task using WordPress. One of our favorite plugins for doing so is Blog2Social, which not only includes an auto-posting feature, but even enables you to optimize your delivery times. In this article, we’ll dig deeper into how auto-posting can help you, what Blog2Social offers, and how to set up the plugin in three steps. If you follow any brands or business on social media, chances are you’ve already come across auto-posted content without even knowing it. After all, the greater the number of platforms you publish to, the more difficult it becomes to handle all that content manually. Increase your efficiency. Posting your content to social media isn’t difficult, but it can be time-consuming. As your editorial calendar grows, so will the time you’ll need to spend manually publishing content to other platforms. Grow your audience. 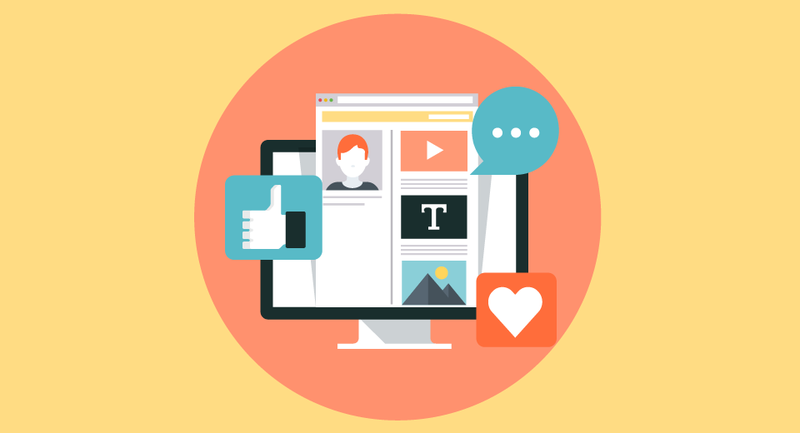 As long as your content is engaging, publishing on social media may enable you to tap into a wider audience. Increase visitor engagement. Social media is one of the best channels to engage with your users, and with the increase in published content comes more opportunities to establish conversations with your audience. It goes without saying that you’ll also need to work hard and produce outstanding content if you want to enjoy the perks of auto-posting. However, that’s a topic for another article. In this case, we’re going to focus on how to use the Blog2Social plugin to auto-post your WordPress content to social media. 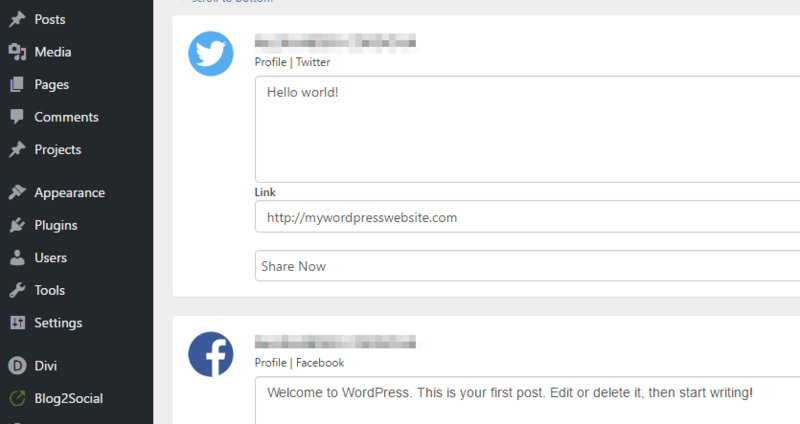 Blog2Social is one of the most comprehensive auto-posting solutions for WordPress. Not only does it enable you to share your content to most major social media platforms, it also lets you schedule posts for specific time windows. In addition, you can add specific tags and comments for each network, which is always handy. The plugin also enables you to customize which images will appear alongside your shared content, and even lets you re-share older posts if you want to showcase a previous ‘hit’, or fill gaps in your calendar. What’s more, there are no compatibility issues with Divi, so you’ll be able to implement it on your own site without worry. Finally, Blog2Social supports a number of platforms out of the box – there are perennial networks such as Facebook and Twitter, along with outliers such as XING, Torial, and Diigo, among many others. Auto-post your content to most major social media platforms. Customize your posts before sharing them on social media. Select which images will accompany your content. Schedule your auto-posts for specific windows of time. Once entered, click on Activate and you’re all set. The premium version offers a 30-day risk free trial, although we think the free version is more than enough for most users unless you need to set up multiple accounts for each platform. Regardless of which version you pick, the rest of the process remains the same, so let’s get on to step number one. By default, Blog2Social supports 14 social media platforms out of the box, but you’ll likely only use a few of them. The first thing you’ll want to do is connect your chosen networks to the plugin. Once you’ve added your social media accounts, the next step is to optimize your post’s delivery times. Blog2Social enables you to configure sharing windows for each social media platform, and it even provides you with information on the best times to post content. It’s worth nothing that you can skip this step if you’d prefer to just auto-post your content to social media as soon as it’s published. On the other hand, if you’d like to retain a bit more control over your timing, keep reading! At this point, make your way through the list and tweak the times for each platform you intend on using. The final step is to learn how to enable auto-posting. Naturally, not every image is going to display perfectly on each social media platform. With that in mind, Blog2Social includes recommendations for optimal dimensions, and takes care of any necessary resizing. Once you’ve finished, save your changes, and you’ll be good to go! At this point, you can sit back and let Blog2Social do all of your heavy social media lifting. Auto-posting your WordPress content to social media is a simple task that can have a lasting impact on your site. It’s time-consuming, but you’ll gain access to a wider user base for each platform you post in. You’ll also get to engage your users in more ways (which is always a plus!). Configure which social networks to use. Set your content to auto-post. Do you think auto-posting your content to social media can bring in significant amounts of new traffic? Share your thoughts with us in the comments section below! Can you use Blog2Social to schedule posts to multiple groups on FaceBook (vs multiple accounts). I belong to many professional groups and want to be able to automatically post links to my website material, repeatedly. Thanks for this helpful explanation and introduction to this plugin. Hi Kayce! I’d suggest posting in the plugin’s support forum to find out: https://wordpress.org/support/plugin/blog2social. Hey John, thanks a lot for this post. This looks like a really handy plugin. I’ve few doubts, though. Does it support OG tags like Yoast does for Facebook and Twitter? Also, do we need to disable the Publicize settings of Jetpack to use it? I mean they both would conflict with one another, won’t they? Looking forward to your response. Keep up the good work! You’re welcome, Vishal! The plugin’s developers would be best able to answer these questions: https://wordpress.org/support/plugin/blog2social. Unfortunately, one cannot use the Auto-Post feature unless you pay for the Premium version. LOL, what a fail. How about a post on using IFTTT? It takes some effort to set up but it can actually do a lot more. I just started using IFTTT, thanks for the suggestion, Jamie! Thanks for the review! I’m always looking for ways to improve my efficiency. I currently use CoSchedule to schedule a campaign of posts, and Buffer to deliver them (WordPress –> CoSchedule –> Buffer –> social media). How would Blog2Social either compare with this, or fit into it? You’re welcome, Bruce! Blog2Social lets you schedule and buffer posts, so it would essentially do the same thing as the system you’ve outlined (except you’d be using one tool rather than two). Thank you for this. I’ve been looking for a good alternative to the Jetpack Publicize feature for a while. Hi Wade! We hope the plugin works out well for you. You lose the ability to really gain traffic from social media posts when you do not edit the copy, images, and set up link tracking in order to test link click through rate. I’d suggest using tools outside of WordPress to schedule posts! Do you have a recommendation, Alex? Hi, Marcus. Jetpack is another good option, although it lacks some of the features of Blog2Social (such as the ability to buffer posts). Thanks alot John..its so usefull for my blog.. I don’t know if this is supposed to happen but as soon as I signed up with this plugin and tried to configure my social media accounts, like 3 minutes later they started to freak out (especially Pinterest) that someone had logged in to my account remotely from an unknown location (somewhere in Europe). I then freaked out myself and changed my passwords because my accounts had been put into ‘safe’ mode. What’s going on, does this plugin use real people to log in and post stuff on your behalf or what? Haven’t they heard of API tokens etc.? Has anyone experienced something like this? It’s hard to say why this is happening without seeing your exact setup (although we can assure you that the plugin is automatic and doesn’t require any real people for it to work). We’d suggest posting in the developers’ support forum to see if they have an answer: https://wordpress.org/support/plugin/blog2social. I tried this out, but it seems like it is missing a key feature. Or maybe I am missing it. How do I schedule a recurring post more than a week a part. Say I want to post something once a month. I do not see any way to do that. As a blog grows posting every piece of content weekly will flood your followers. Is there a way to do this with blog2social?